A fluid combination of alignment-based movement and Restorative poses. 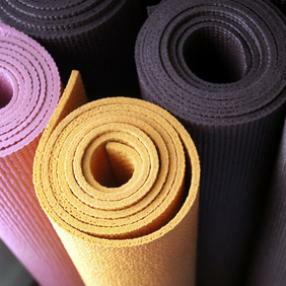 The first part of class will focus on breath, active stretching, and movement that will spark up energy and vitality. The second part will consist of passive, relaxed, supported poses that create space for deep meditation. All levels. A foundation for learning the whole scope and depth of the Iyengar method is taught in standing poses, shoulderstand, other fundamental postures, and breath awareness. This class is for beginners. In this class we will work on internal and external hips rotation in relation with knees and feet. Focusing on creating space & strength in our joints and ligaments. We will also focus on building muscle and core strength. Understanding that flexibility and tightness need to work in harmony for a healthy body. We will synchronize the breathe and movement to help release pain and tension in the body. Please check with your doctor before admitting to class. Michele is a CIYT, Certified Iyengar Instructor, and a IAYT Certified Yoga Therapist. Linking postures with breath and meditation. Beginners standing postures, balances, inversions, and pranayama. 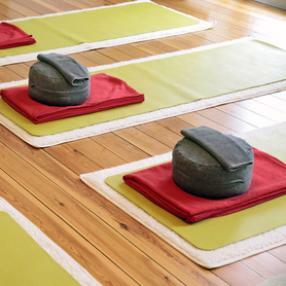 This class focuses on poses that promote relaxation, restoration and rejuvenation. Restorative poses help relieve the effects of chronic stress, including weakness and fatigue brought on by our daily fast paced activities. Each restorative sequence is designed to move the spine in all directions by practicing backbends, forward bends, twists and inversions using props allowing for deep relaxation. These poses teach us how to cultivate awareness by bringing our attention to the areas we hold tension and consciously releasing and letting it go.